Taschen's monumental three-day warehouse sale kicks off Friday. 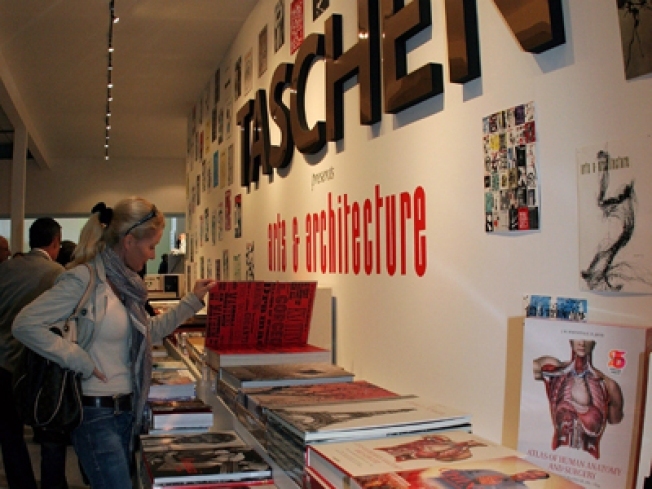 STACKED: We think you can never really have enough Taschen books. The quirky, rule-bending art-book publisher is slashing prices at its SoHo store for a three-day sale, letting you scoop up sample copies of its excellent tomes for up to 75 percent off. 11AM to 8PM; through the weekend. LONELIEST NUMBER: Yes, David Fincher's Curious Case of Benjamin Button just scored approximately 68 Oscar nominations. Brad Pitt aging backwards is all well and good, but for our money, Se7en is Fincher supreme. Nothing he's done since (save for the epic Fight Club) even comes close. See Se7en at midnight at the Sunshine. 12AM. MEET CUTE: In the vein of the Bird and the Bee or She & Him comes Via Audio, a sweetly twee boy-girl band with catchy tuneage. They play Park Slope's Union Hall tonight at 8PM.